"A girl's journey when Boundary starts to break in two." Sohalia Fairbane is a normal girl. She left her home, the small town of Boundary in the middle of a forest, the day after finishing year twelve. She parties with her friends. She drinks, and watches Supernatural, and goes to the beach, and does a normal degree (Biochemisty). Her life is so normal—single child, split family—she could be abnormal. So, there is no way she’s not normal, no-sir-ee. Except for the fact she has a metal allergy—something other people don’t have—and it’s a constant irritation because it burns her skin. And that she can see auras if she tries really hard. And that she has blonde hair and tanned skin. But everyone has their quirks, right? So when she’s forced home for the summer, Sohalia thinks she’ll try out this social media thing. She has no idea what is waiting for her in Boundary, or how much she’ll come to rely on this blog to keep all her memories straight. Shattered has not been tagged yet. 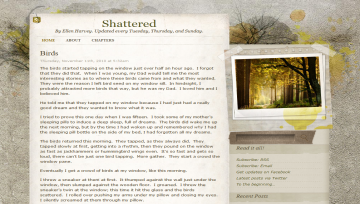 Help others find Shattered by tagging it! Shattered has not been reviewed yet. Shattered has not been recommended yet.